There may be few things as cute as a fat puppy, but puppy obesity can lead to overweight dogs, and that can lead to many health problems. Obesity is defined as exceeding ideal body weight by 20 percent, and today is considered the most common nutritional disease of dogs. A survey of veterinarians indicates that up to 50 percent of adult dogs are overweight or obese. If an owner is not paying close attention to ration control, they are much more likely to end up with an overweight pup that becomes an obese adult dog. Large breed pups that are overweight are at increased risk for hip dysplasia and bone/joint problems as adults. Obesity doubles, triples, or quadruples risk for diabetes, and is also an aggravating factor in heart problems, arthritis, and allergies. Obesity is also a longevity issue. Long-term studies show that thin dogs live up to two years longer than obese dogs. Dog breeds such as beagles, Labradors, and Shelties are more prone to obesity than others, suggesting there is an inherited "fat gene" in dogs. Spaying and neutering cause a 15 to 20 percent reduction in a pet’s metabolic rate—that is, how fast and efficiently food is used. Unless food intake and exercise are adjusted after your puppy's neuter surgery, the pup will likely gain weight as an adult. Today’s pets are overweight because couch potato dogs exercise less, are fed high-calorie tasty foods, and often overeat either out of boredom or from being given too many treats by their owners. All of that loving kindness can turn info dangerous fat. Weight gain can happen very gradually. Also, most people don’t recognize that a pet falls outside healthy weight parameters. Is he fat or fluffy? A scale by itself isn’t the best way to tell if your puppy is overweight. A much better measure is a hands-on approach. A number of pet food companies provide “body condition score” charts to veterinarians that show picture examples of underweight, overweight and ideal body shapes for pets. Some dog breeds call for slightly different compositions. For instance, Greyhounds and other coursing breeds are supposed to have visible ribs. You may not see this difference until the puppy reaches adolescence. For most breeds, you should be able to feel your dog’s ribs but not see them. From above, you should see a decided break at the waist, beginning at the back of the ribs to just before the hips. In profile, pets should have a distinct tummy tuck beginning just behind the last ribs and going up into the hind legs. 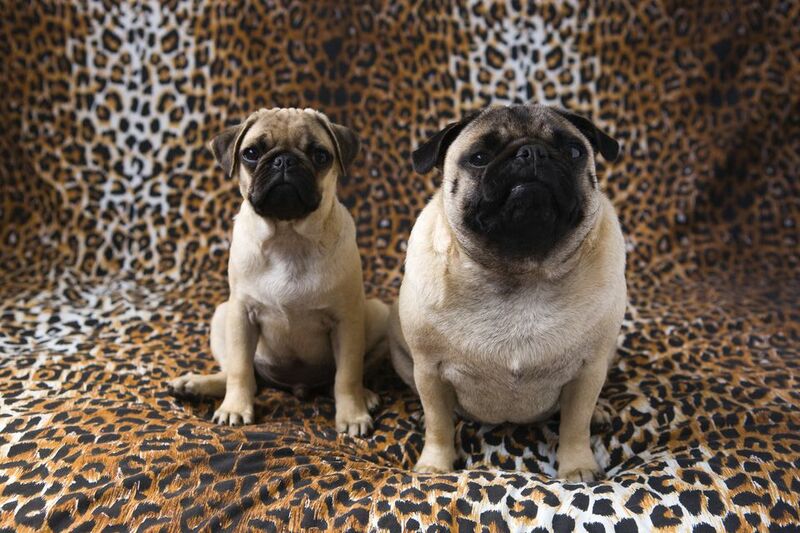 Overweight dogs often develop rolls of fat on the lower back above the tail. If you can't feel the pet's ribs, or she has a pendulous or bulging tummy, your pup is too plump. If your puppy carries too much weight, get it under control by working with your veterinarian. Before beginning a diet, your veterinarian should examine your puppy to rule out potential health complications. Like people, puppies should lose weight in a safe, gradual way. Usually, the target is to lose about one to one and a half percent of your pet’s starting weight per week. Your veterinarian will calculate how much weight should be lost, and suggest a diet and exercise plan appropriate to your pet. To properly regulate feedings you must know the caloric needs of your pet and the caloric content of the food and treats you’re feeding. Read the puppy food label. Most pet food manufacturers provide caloric content of their products or by calling their 1-800 numbers. Figuring how many calories a pet needs is more difficult. There’s a tremendous variation from one animal to the next as to how many calories it burns in a day, and much of that depends on the activity level and even the age and breed of your pup. Your veterinarian can choose from formulas to determine basal (resting) or maintenance energy needs for growing puppies or for adult dogs. Several pet food companies have software programs for weight management cases that allow veterinarians to plug in the weight of the animal for an estimate of their caloric needs.